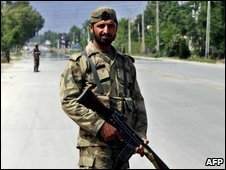 At least 10 soldiers have been killed and nine wounded in clashes with suspected Taleban militants in Swat Valley, Pakistan's military has said. The deaths came as fighting intensified in Swat and other areas of the north-west, and helicopter gunships and warplanes bombed militant targets. 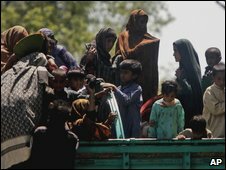 Thousands of civilians are fleeing the area, with fighting especially heavy in the main town of Swat, Mingora. Half a million are still trapped in the town, without water or electricity. Speaking in Afghanistan, US Defence Secretary Robert Gates said he was "very satisfied with the strong response that the Pakistan army and government have taken". He said there was "very little chance" of the Taleban achieving the kind of success in Pakistan that they would need to get access to the country's nuclear weapons. On Wednesday, US President Barack Obama vowed after talks in Washington with Afghan President Hamid Karzai and Pakistani President Asif Ali Zardari to "defeat al-Qaeda" and its allies in Pakistan and Afghanistan. The International Committee of the Red Cross (ICRC) has meanwhile warned that a humanitarian crisis is intensifying in north-west Pakistan. In a statement the ICRC said that it no longer had access to the areas most affected by the conflict and that precise statistics of the displaced were difficult to ascertain. Military spokesman Maj-Gen Athar Abbas told the BBC that the 10 soldiers had been killed over the past 24 hours in Swat. At least seven of them were reported to have died when a troop carrier was ambushed near Mingora. Inside Mingora, the Taleban are getting ready for an attack which local people expect to be imminent. One eyewitness told the BBC he had seen militants planting land mines, digging trenches and cutting down trees to block roads. A curfew was once again lifted to allow civilians to leave Swat and join the tens of thousands who have already moved into camps or the homes of relatives further to the south. All are desperate not to get caught in the crossfire, and there are reports that thousands more have taken advantage of the break in the curfew. "A mortar shell hit the outer wall of my house last night. Luckily, we survived. I feel God has given me an opportunity I can't miss. I'm leaving. Swat is not worth living in," pharmacist Nasir Jamal told AFP news agency. Residents say at least 24 civilians have lost their lives in the past two days. Some died when their houses were hit by artillery, while others were reportedly shot for defying a curfew. The BBC Urdu service's Riffatullah Orakzai says that eyewitnesses in the Kanju area near Mingora have seen militants set up checkposts on the main roads and are not allowing people who want to flee the fighting to pass. Witnesses say a large number of people, including women and children, are now stranded there. 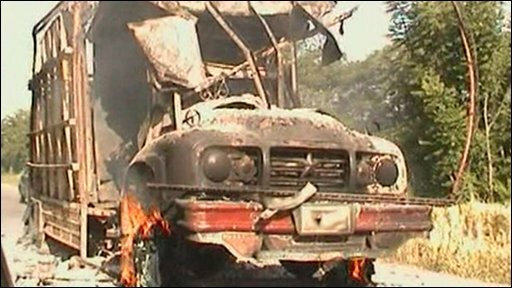 Shaukat Saleem, a lawyer who spoke to the BBC from Mingora, said that about 200,000 had now left the town, with a further 500,000 civilians remaining. He accused both the army and the Taleban of shooting civilians who tried to flee the fighting. Mr Saleem said that electricity supplies were sporadic and there was little or no water, while the price of goods had shot up. During the day there is usually a lull in the fighting, Mr Saleem said, with the Taleban very much in control. But at night the exchanges of fire increased and a lot of people had been killed. Troops moving into the Swat valley have been attacked by remote controlled bombs, while the army says it has killed dozens of militants. It also says it has recaptured emerald mines in the Shahdara area, near Mingora, which were being operated by the militants. Much of the fighting has focused on a hill which overlooks Mingora. The army says the Taleban have seized key buildings inside the town. The BBC's M Ilyas Khan in Islamabad says troops moving into Swat face resistance all along the 40km (25-mile) road that heads in a north-easterly direction from Malakand to Mingora. Our correspondent says that fighting has not only erupted in several areas around Mingora, but there are also reports of more clashes in the neighbouring area of Buner. In another incident, militants overran a paramilitary fort in the Chakdara area of Lower Dir, officials say. Three paramilitary soldiers were killed in the attack and 10 policemen were taken away as hostages. Meanwhile the son of the cleric behind a now defunct peace deal between the government and Taleban in Swat has been killed. Family members of cleric Sufi Mohammed say his son, Kiffayatullah, was killed in the Daro area of Lower Dir late on Wednesday night.